The Mugenri Barrier (无現里結界, Mugenri Kekkai) is the border between Mugenri and the Outside World, which allows youkai to survive within Mugenri. It is separated into the "outer" and "inner" barriers. It is known that the Senri Shrine is located on the border. The barrier was created possibly by Tsurubami Senri's ancestors and reinforced by the barrier builders from the barrier shop, "Azumaterasu". It was the setting of Yabusame Houlen's Extra stage of Evanescent Existence. The barrier is very likely to be based on the Great Hakurei Barrier that seals away Gensokyo . 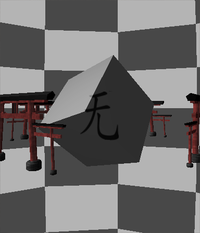 The inside of the barrier shown in Evanescent Existence is set on a rotating black-and-white checkerboard background (the "outer" barrier), and contains a cube with the rare kanji mu (无, lit. "nothing") inside (the "inner" barrier). The cube is surrounded by torii. Tsubakura Enraku and their friends are spirited away to Mugenri, so it's up to Yabusame to find Tsubakura. After crossing between dimensions and fighting all their friends, who have gained powers, the priest Tsurubami spots Yabusame and transports them to the barrier. After explaining their motives to abduct everyone, the two fight inside the barrier and Yabusame is victorious. Apparently the barrier was weakened after a rampaging Lumen Celeritas absorbed moonlight and started attacking everything in sight during the events of Earthen Miraculous Sword. Because of this, Tenkai Zuifeng (an Azumaterasu Barrier Shop apprentice) was appointed to repair it. Offended at their prestige, they decided to make a prank by creating a hole in the barrier, causing for a huge amount of spirits to enter the barrier, which in turn were absorbed by the Harujion, resulting in the birth of Shion. Jinbei recognizes that Tenkai should have fixed the hole in the barrier by then and asks the heroes to chastise them. They found them in the Road Travelled by Light, while they were repairing the barrier. After being defeated by the heroes, the Mugenri Barrier is more damaged than before, but Tenkai doesn't care and leaves. This page was last edited on 14 November 2018, at 12:58.